Foil Race – The growing new and exciting discipline on the PWA Tour requires a very special design mandate. The basic necessity to create high pointing angles upwind coupled with as much stability in the air as possible, whilst at the same time having a board that creates a high amount of lift, yet also cut the air cleanly and without high drag coefficients, this was not an easy ask! The test result was clear. An ultra compact outline and super boxy rails the entire length of the rail helped greatly to steady the board in the air. High amounts of volume, especially in the nose, created an excellent platform for very low wind planing ability. This also created more usable power upwind to out point the fleet off the start line and also to have deep and low angles downwind, the key attributes required for success in current foil racing formats. • All-new ultra compact and ultra wide nose/tail shape for increased power and angle upwind combined with solid stability downwind. Excellent glide and acceleration in the air. Very early planing due to the clever volume distribution. 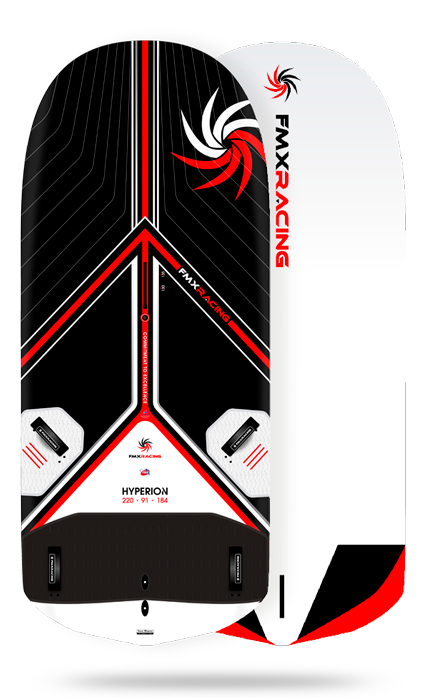 • Refined all-new dedicated foil racing scoop-rocker line for easier handling, explosive acceleration and top-speed in both flat water and choppy foiling conditions. • T-Beam style coned deck shape – Increases light wind power, drive, general stability and nose trim stability at high foiling speeds. • Reverse Vee bottom shape – Generous vee and double concave configuration in the nose to clear the chop and create a smooth ride especially when touching the nose coming off the foil, transitioning to less vee and dc in the tail for easier tilting of the board angled to the side for earlier planing alongside better glide when touching. • ‘V3 Vector Cuts’ – All-new straight line cutout design that facilitates clean and effortless water release for ultra fast planing onto the foil. • ‘Downwind Dominator’ – Original deck recess area in the middle of the deck gybe area that increases the ability to pump deeper downwind in light wind and have more control overpowered. Fitted with a one piece 6mm deck pad from rail to rail to facilitate comfort and grip without having to fit subsequent footstraps that get in the way during foil gybes and tacks. • Deep Tuttle Foil Strong Box – Double the carbon content, double the wall strength and stiffness, double the width compared to a normal tuttle box, and built with a 100% high-density PVC sandwich body. The result – foils stay tight and the box holds the direct feeling performance even after prolonged use. Stability and function, these are the highlight points of this all-new foil race board design. 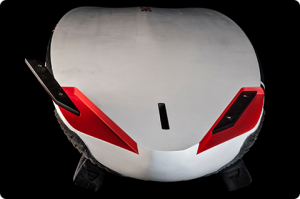 Plane in 4-5 knots of wind or power through the chop in 30-knots of wind, this board can handle any and all foil race conditions that you will likely encounter at any foil race events around the globe. A no compromise racing machine that will elevate your game! • Hull weight includes 12 extra single footstrap plugs (8 for straps, 4 for cutouts). This adds 100g so keep this in mind when comparing weights.